Today, custodian communities can ‘register’ their ICCAs if they wish to make their existence visible in the international arena. The UN Environment World Conservation Monitoring Centre (UNEP-WCMC) of UN Environment provides communities with the option of documenting their ICCAs directly in the World Database on Protected Areas (WDPA) and/or in a dedicated international ICCA Registry that they manage. Before you register, however, it is important that the ICCA undergoe a peer-support and review process, to assure that it is a genuine ICCA, and that appropriate procedures for its registration, such as Free Prior and Informed Consent (FPIC), have been followed, and that appropriate standards are met. The International Union for Conservation of Nature (IUCN) defines a protected area as “…a clearly defined geographical space, recognised, dedicated and managed, through legal or other effective means, to achieve the long-term conservation of nature with associated ecosystem services and cultural values”. If the ICCA fits this definition, its custodian community may register it as a protected area, and thus request UNEP-WCMC to include it in the WDPA. 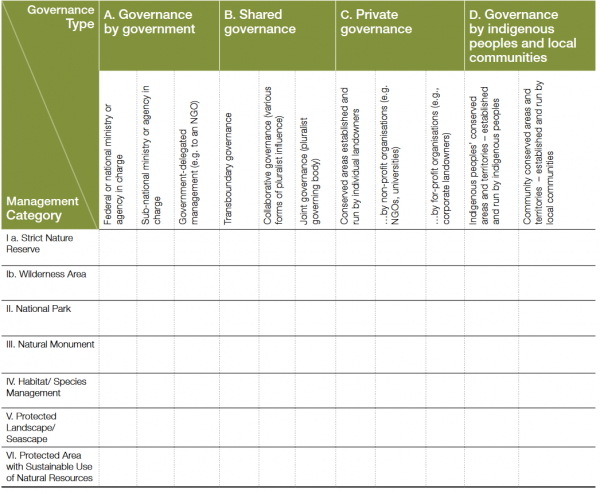 The WDPA is a database of all types of protected areas, and includes ICCAs as an example of one of the four main types of governance. To register an ICCA, the community or its representatives should complete a questionnaire and Data Contributor Agreement (DCA). A condition of the DCA is that the community has given its free, prior and informed consent (FPIC) for the data to be provided. The community should also provide a map of the ICCA, which will be made available online through the protected planet website. The ICCA Registry is a database of ICCAs only. It stores information in a similar format to the WDPA, but can include more details and the custodian community that provides the information has the option of maintaining it in the database but making the information unavailable to the public, if it so decides. The community has the additional option of submitting a case study, or short narrative description, of the ICCA, which can be publicly accessed on the Internet and does not require registration. To register an ICCA, the community or its representatives should complete a questionnaire and Data Contributor Agreement (DCA). A condition of the DCA is that the community has given its free, prior and informed consent (FPIC) for the data to be provided. The questionnaire asks about, among others, the location and environmental characteristics of the ICCA, how it is used by the community, how it is governed and managed, what kind of rights the community has over the ICCA, the threats it faces, and its history. Before an ICCA can be included in the registry, the ICCA undergoes a peer-review process, to be confident that it is a genuine ICCA, that appropriate procedures for the registration have been followed and that appropriate standards are met. Please read here below on the peer-review process. Before an ICCA is internationally registered, it should undergo a peer-support and review process, to be confident that it is a genuine ICCA, that appropriate procedures for the registration, such as FPIC, have been followed, and that appropriate standards are met. Such processes are to be developed and led in each country by a bona-fide network of ICCA custodian indigenous peoples and local communities. Because the tasks to be performed are sensitive, the network should be benefit from a certain legitimacy by indigenous peoples and/or local communities in the country. For countries where a peer-review process exists, it is compulsory for data to go through the process before being included in the databases (ICCA Registry and/or WDPA). However, if no peer-review process exists, UNEP-WCMC will hold data until a process has been developed. In these cases, data are tagged as ‘awaiting peer-review’. They are used for analyses, but are not displayed online or shared. If you are uncertain whether a peer-review process has been developed in your country, please contact iccaregistry@unep-wcmc.org. UNEP-WCMC, the ICCA Consortium and the UNDP GEF SGP (if an office exists in the country) can provide further guidance on designing and implementing a peer-review process. It can be done as part of the ongoing ICCA Global Support Initiative. Every candidacy to the Registry in Spain (communities applying to be included in the ICCA Registry) should agree to be subject of revision by 2 anonymous members of other similar Spanish ICCAs (evaluators should be mandatorily community members of other ICCAs). This is the core approach of a peer-review. The process is facilitated by Iniciativa Comunales (a national Spanish network), but it is the current Spanish ICCA communities (already included in the Registry) who take the decision on whether a candidacy joins the Registry or not (based on the revisions, and other considerations). For this a specific Committee is in place. Spanish ICCAs, along with experts (community leaders, academics, etc.) meets once a year for a sound revision of the methodology, steps and governance structure of the peer-revision process. A simple description of the ICCA network in Spain and the processes it has developed, is available here. A peer-review process has been outlined by the national ICCA Consortium, called Bukluran, in collaboration with the national Indigenous Peoples’ coalition, called KASAPI, and the Philippine Association for Intercultural Development. The process describes how the decision to register should arise as part of a larger process in which communities collectively develop their awareness and understanding of their ICCA’s values. This process may involve participatory mapping, or other documentation, or community-based planning exercises. Once the community has collectively decided, through a free, prior and informed consent process, to register their ICCA, the peer-review process is carried out. The peer-review process is carried out by the ICCA representatives who have been elected to run the Philippines ICCA Consortium. As part of this review process, the representatives consider whether registration poses possible threats to the ICCA’s biodiversity or cultural values. The ICCA data is then submitted to the ICCA Registry, with the aim of providing an added layer of protection to the ICCA, and to encourage the community to pursue their conservation aims and other ambitions. A four-step process has been outlined by UNINOMAD, which is the Union of Indigenous Nomadic Tribes of Iran, in collaboration with Cenesta, which is the Centre for Sustainable Development and Environment. And a governance assessment, involving identification and strengthening of customary governance structures. If the results of these assessments reveal that the area can be considered an ICCA, then the community can decide to take a free, prior and informed decision to declare its ICCA. This is step two. In step three, the community can choose to submit the results of their assessments to the National Registry of ICCAs, which is maintained by Cenesta. In the final step, Cenesta prepares the documentation for inclusion in the ICCA registry and/or WDPA. At this point, the information is also sent to relevant government agencies, for their information and for inclusion in reporting on international agreements.